ImageGear for .NET adds enterprise-class image viewing, processing and editing functions easily to any application, with support for more than 100 file formats and expanded functionality such as optical character recognition (OCR), barcode recognition and support for medical DICOM images. why do i want this .net image processing library? All the image functions you could ever need, all in a single toolkit. Effortlessly control and distribute the exact functionality your application needs. View and edit more than 100 image file types, including TIF, JPEG, PDF, CAD, DICOM, HD Photo, Camera RAW and many more document and image formats. Create true Zero Footprint web-based and mobile applications for document and image viewing, management, and processing using ImageGear’s ASP.NET HTML5 functionality. Enhance your application with fast, powerful, selectable functions for an exhaustive list of file types. 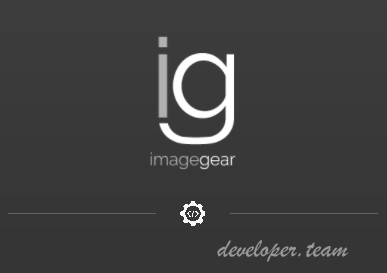 ImageGear .NET supports over 100 image, graphic, and document formats, including raster and vector images, PDF, JPEG, JPEG 2000, GIF, TIFF, DICOM, CAD, ABIC Check Imaging, HD Photo, Camera RAW, and more (see complete list here). All supported formats also have robust save options for complete format control. It easily converts images from one format to another and bitmap images to scalable, editable images in seconds. It loads and displays Microsoft Word, Excel and PowerPoint documents stored in the XML DOCX format. Support for loading of headerless RAW image files is available. Add powerful viewing and viewing-enhancement functions that take full advantage of Windows GUI features. It includes support for WinForms, ASP.NET, and WPF, and also includes GUI features such as common dialogs for image loading, saving, processing, and more. High-speed display provides complete control over how your application displays images. Shorten development efforts by using GUI functions that simplify the implementation of several sophisticated GUI features. Utliize Anti-Aliasing and Smoothing on color and black and white images. Get a handle on PDF processing with functions for conversion, library management and more. It incorporates the Adobe PDF Library. Convert Microsoft Office Open XML documents to PDF and existing PDF files to PDF/A. It even enables the creation of PDF/A files from Raster Images. The product reads, writes, displays, and edits Portable Document Format (PDF), PostScript (PS), and Encapsulated PostScript (EPS) and has comprehensive PDF API for native PDF annotations, searchable text, and more. ImageGear provides low-level access to the PDF libraries. Easily integrate PDF into your imaging applications. Automatically conform to the PDF Language Standard, as well as open and process PS and EPS files. Quickly add annotations to a PDF document. Annotation marks include text, line, freehand polyline, rectangle, ellipse, polygon, polyline, audio, image, ruler, protractor, encryption, button, hot spot, and rich text. This version also includes the ability to import and export these marks to XML files. The application developer has the flexibility to embed a subset of these annotation types into the PDF file as a true Adobe annotation or to save them in a separate file. An automatic page layout decomposition process that breaks image into individual zones for processing. Located Zones are assigned a type based on expected content: flow, table, graphic. Advanced Table detection improves data result reconstruction. Process an entire image or just the section containing the information you need. Zones can be defined on the fly by a user, loaded from a file, or detected automatically by the engine. Flexible API gives developers the ability to define areas of images to be processed and the type of content located in that defined area. Specialized content? Define the appropriate recognition module for your content. Each character is returned with an accuracy Confidence Value with alternate character information. One incorrect character can drastically change a word; for this reason the recognition engine reports a certainty value for all recognized words. Advanced font information and location information allows ImageGear to create text representations of the original, with a similar layout. The ImageGear OCR engine processes all data in a Unicode format. The data output can be formatted for a specific code page. Advanced Image Processing methods are available to improve OCR accuracy. For highest accuracy the OCR engines looks for dark characters on a pale background. Auto Inversion functionality detects if the image needs to be inverted for highest accuracy. Images getting scanned upside down? Processing landscape documents? Automatic image orientation detects and adjusts images so they are properly oriented. Deskew methods will detect image misalignment and automatically correct it, improving auto-zoning and recognition accuracy. Despeckling methods remove minor dots and imperfections in the image capture process. Resolution enhancement can be performed to improve the quality of the low resolution images. A complete Checking Subsystem used to improve recognition accuracy. Advanced spell checking using 17 different language dictionaries is provided. Each dictionary contains between 100,000 to 200,000 entries. Vertical dictionaries improve spell checking and OCR accuracy for medical and legal industries. Developers can use event based checking to start validation work flow. The ImageGear for .NET OCR functionality supports two sets of languages, Western and Asian. These language options are licensed separately for development and deployment. The Asian offering has some basic support for western characters, but this support will not utilize any dictionaries to improve results. If you need support for both sets of languages please contact us. The Western Language support for the ImageGear for .NET OCR functionality is available in two different editions for distribution, Standard and Plus. The primary difference between these two versions is the list of output formats created by the OCR engine. The ImageGear for .NET product with Asian Language support is only available in one edition, which follows the Plus Edition. The PDF formatting in the Standard Edition is accomplished using text output reported by the OCR engine and ImageGear’s internal PDF engine. Formatted output is created by using all of the recognition information (font detail, located image areas, and recognized table structure information) to reconstruct a representation of the original document. The Plus Edition leverages the power of the OCR engine to create the robust formatted output. Empower your applications to perform a broad range of image cleanup, correction and transformation functions. Tap the full power of TWAIN-compatible devices through comprehensive TWAIN function support. Comprehensive support for the latest TWAIN devices including scanners, digital cameras, and video capture boards is provided. It works with multipage and single page scanning, with configurable parameters, and controls all scanner capabilities within your program. The TWAIN transfer mode is quickly defined, and the display of the TWAIN UI is programmatically controlled. Easily works with TWAIN: v1.6, v1.7, v1.8, v1.9. Easily integrate RESTful services, a rich jР°vascript API and more to deliver an optimal viewing experience. View Office files with complete clarity with SVG-based rendering. Customizable interactive interface empowers the creation, modification and saving of annotations, while Configurable RESTful Services simplify loading or image and annotating content. Support for display of over 100 formats, including commonly used Microsoft Office formats is available. Built-in services enables easy integration with multiple content/image repositories. Easily manipulate photos and color images to get enhanced image quality and minimal image file sizes. Region of Interest (ROI) support permits specification of a shape, such as ellipse, polygon, freehand, or a 1-bit mask, for identifying pixels to include/exclude from image processing algorithms. Powerful color reduction methods are available for maximum quality and minimum size, using dithering or halftone. Give your users the ability to add, edit and burn-in XML-based annotations, and define your own annotation types. This feature includes support for WinForms, WPF, and ASP.NET and offers easy to implement UI elements with XML-based annotation for images and medical data. Create custom annotation types, and control granular security settings to control annotation access. It contains the Accusoft Redlining Toolkit (ART), enabling annotation on images and documents such as lines, arrows, protractors, rulers, highlighting, sticky notes, and much more. Hook web apps into scanner functions to deliver high-quality scanning directly to cloud storage repositories. This feature enables Web Applications to communicate with document scanners with no special server requirements and no ActiveX plug-ins used. It leverages the power of ISIS to control Scanner Features, and also provides connectivity to TWAIN-based devices. It is available in zero-footprint capture for all devices that support Cloud Capture natively, or a one-time download of the Cloud Capture web services component. Support for popular Windows browsers like, Internet explorer, Firefox, Safari and Chrome is offered. Accurately decode barcodes most other engines can’t.